Do you wish you could wave your wand to summon a magical apple strudel like the one Queenie made in the movie Fantastic Beasts and Where to Find Them? You’ll have to go to Ilvermorny for that, but you can follow my recipe to make your own muggle-style. It’s easier than pie with store-bought filo pastry dough (also called phyllo or fillo dough). The enchanting flavor comes from flaky light layers of buttery pastry that embrace spiced apples, nuts, and raisins. Because my vegan version is all plant-based, cows and all the other fantastic beasts approve. 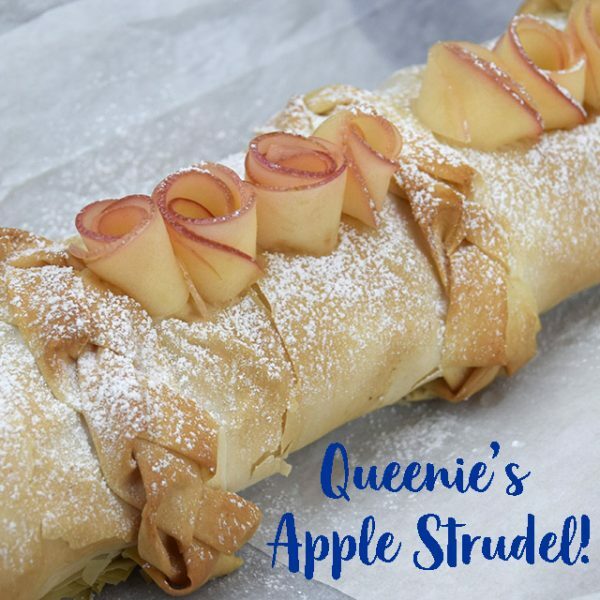 Roll up an apple strudel before watching the new Fantastic Beasts movie, for Thanksgiving, or any special fall meal. I wowed friends at a Harry Potter dinner party with the one you see in the pictures. If you’ve never worked with filo or made apple roses before, allow more time. Think of it as a craft project that you won’t need to store or dust. Skip the braids and apple roses to cut the prep time in half. 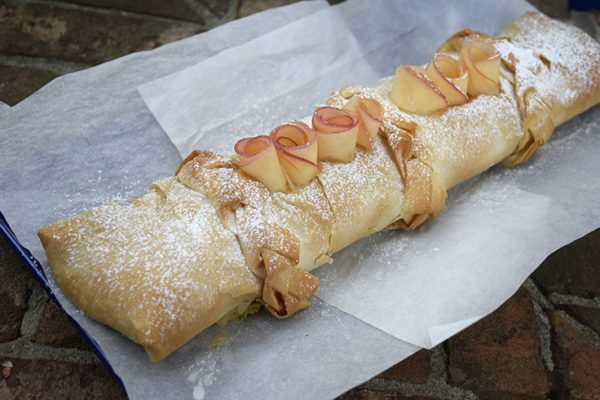 A buttery vegan version of the apple strudel featured in the first Fantastic Beasts movie, stuffed with apples and raisins and decorated with braided pastry and apple roses. Dairy-free and egg-free of course. 6 tablespoons vegan butter divided. Look for Miyoko's or Earth Balance. Heat oven to 375 degrees F (190 C) with a rack in the center. Line a rimmed cookie sheet with a reusable baking liner or parchment paper. Spread a clean tea towel on your counter. Get out another tea towel to cover filo. Melt vegan butter (hereafter known as "butter") in a microwave or on the stove. I put it in a microwave-safe dish, cover it, and zap on high for 20 seconds. Stir and microwave a few more seconds if needed. Unroll filo and lay a sheet of filo flat on the tea towel. Brush with melted butter. Repeat with five more sheets on top of the first. As you work, cover remaining filo with the other towel so it doesn't dry out. Don't worry if the filo tears. Just lay it down as close to flat as possible. The multiple layers will make up for most rips. 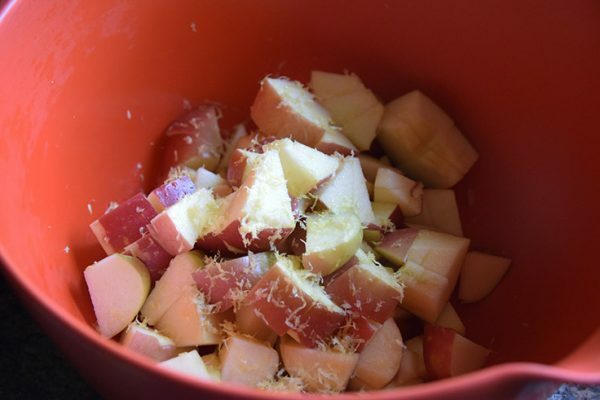 Core, slice, and chop two apples and put them in a large bowl as you go. No need to peel! Zest lemon over apples. Mix brown sugar, spices, and salt in a small bowl, then stir into apples. Stir in walnuts and raisins. Put breadcrumbs and about a tablespoon of butter in a skillet and brown over medium heat until fragrant and golden, about five minutes. Stir into apple mixture. Put apple mixture along the long side of filo about one and a half inches away from the edges. Use the tea towel to help you roll up the strudel. Tuck in ends after the first complete roll as you would for a burrito, then finish rolling. Gently lift the strudel onto the baking sheet with the seam side down. Use both hands, each in about one-third from an end to avoid tearing. To make filo braids, put one sheet of filo on the tea towel, brush with butter, and cut into nine strips the short way. Fold each piece three times and make three braids. My Taster held the sets of three strips at one end at eye height for me to make the braiding easier. Wrap braided filo around the strudel. Brush strudel, including braids, with butter. Bake strudel for 30 to 35 minutes, until deep golden brown. Cool until just warm before serving. While strudel bakes, make apple roses if desired. Put juice from lemon with two cups of water in a microwave-safe bowl. 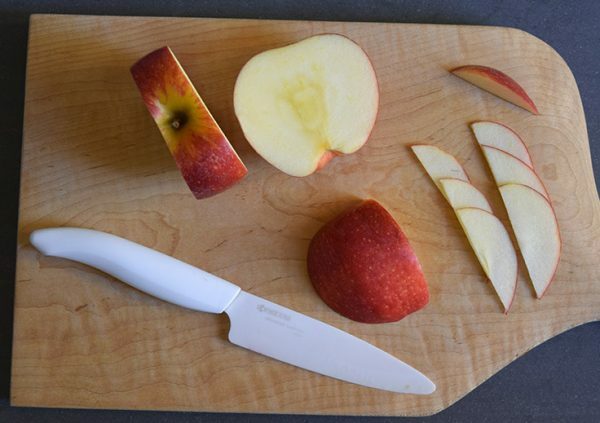 Cut apple twice on either side of the core, then slice the two apple rounds as thinly as possible. Use your best knife or a mandolin. I used my Kyocera ceramic paring knife, which has kept its edge for years, almost as if it were enchanted. 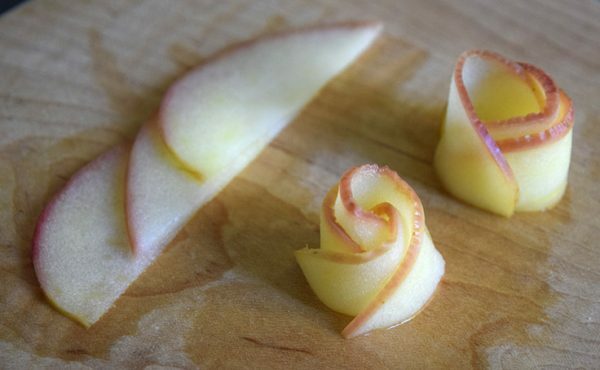 (If you haven't created apple roses before, you may want to make a trial rose or two with three to eight slices before slicing the remaining apple.) Put apple slices in lemon water and microwave on high for three minutes. Let rest for five minutes. Slide a metal spatula underneath to loosen any sticking points and then transfer strudel to a serving plate. Lift a few apple slices out with a spoon. Lay three or four slices so they overlap by about two-thirds, forming a shape with a straight bottom and scalloped top. Starting at the narrow end on the bottom, roll up into an apple rose. When strudel comes out of the oven, line up apple roses between the braids. Use a sieve to dust strudel with powdered sugar. Make sure to dust the apple roses to help them stay together and to sweeten after their lemon bath. Slice and serve warm or at room temperature. Eat apple roses within six hours. Any extra strudel keeps covered at room temperature for three days, but is crispiest within a few hours. Queenie peeled her apples, but I like the color, texture, and nutrition that they bring. Chopping the apples breaks up the peels into an enjoyable size. I skipped the buttery breadcrumbs the first time I made this. The juices ran out of the strudel and burned onto the pan. My Taster also likes the buttery flavor they bring to the apples. I tore one strudel lifting it on to the cookie sheet. No worries! I just set aside the filling and started over with more filo and vegan butter. I draped half the torn filo across a pie plate, added chopped apples, sugar, and cinnamon, and covered with the remaining filo. After baking it for 30 minutes, I had a rustic apple pie! Wondering what to do with your extra filo? Make a Greek Collard Roll. It's a great way to explore the savory side of filo and maybe to get your loved ones to eat more vegetables ... like magic!